After Sony had left the PDA market, there remained just one big maker of Palm OS-driven devices. This is palmOne (we don't take Samsung into account, as the company doesn't plan to release Palm OS devices, as it shows preference for Symbian and Windows Mobile). 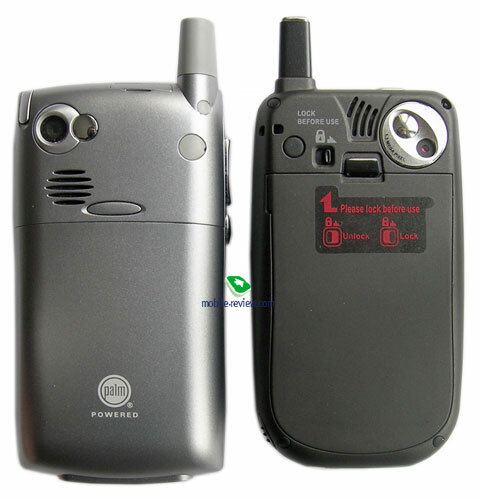 There are some small companies engaged in releasing Palm OS communicators. We can remember GSPDA and QOOL LABS. 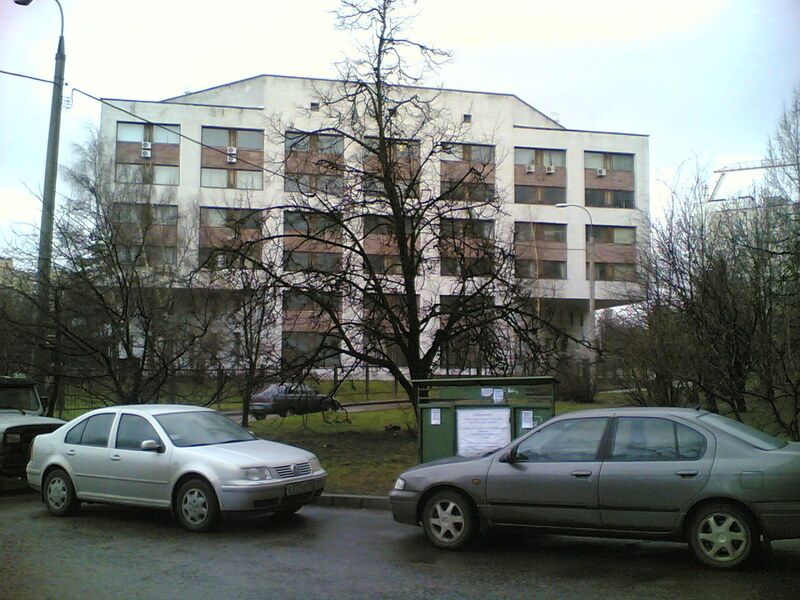 Under the current conditions, when there is no new Palm OS models (the information vacuum), mass media sources pay much attention to the products by these companies. Very often the interest is hardly justified, the models turn to be not interesting (low quality, cut functionality, inadequate price). 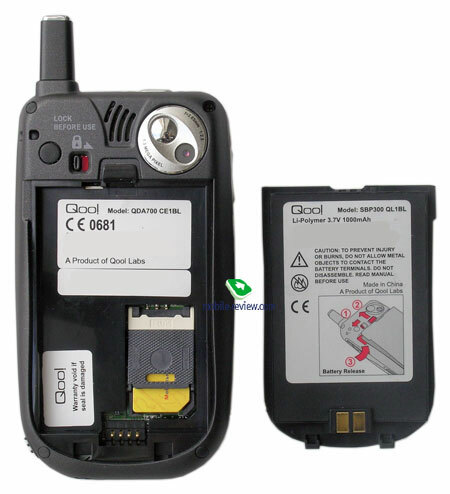 Today we'll deal with a QDA700 model offered by the Singaporean company Qool Labs, the model was announced in September 2004. 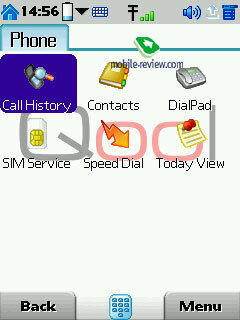 The name of the device is written on the shell as Qoo! - it might be a variation of "Cool!" spelling. The company specializes in making personal multimedia devices, such as MP3 players, smartphones (there is just one smartphone in company's portfolio so far). The company positions this model as the smartphone with a 1.3-megapixel camera, as a matter of fact, it's the first Palm OS smartphone with a megapixel camera onboard. Not many noticed that the screen resolution isn't standard for Palm OS-driven devices - 240x320 pixels (as in typical Pocket PC smartphones, the support of this resolution appeared in Palm OS Garnet 5). The smartphone represents a pseudo-clamshell. When you press a big button at right, the flip cover gets open and bares the full screen, but you have to close it manually. By opening the cover you can answer calls, if you tick it in settings. Some words about design. When the smartphone is closed, it resembles a race car. There are no strict lines, all edges are smooth. 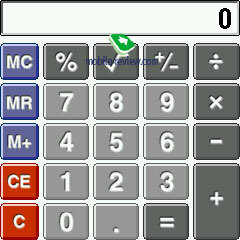 Its rounded form is better expressed with the application buttons arced on the front panel. A small survey among target groups revealed the following. 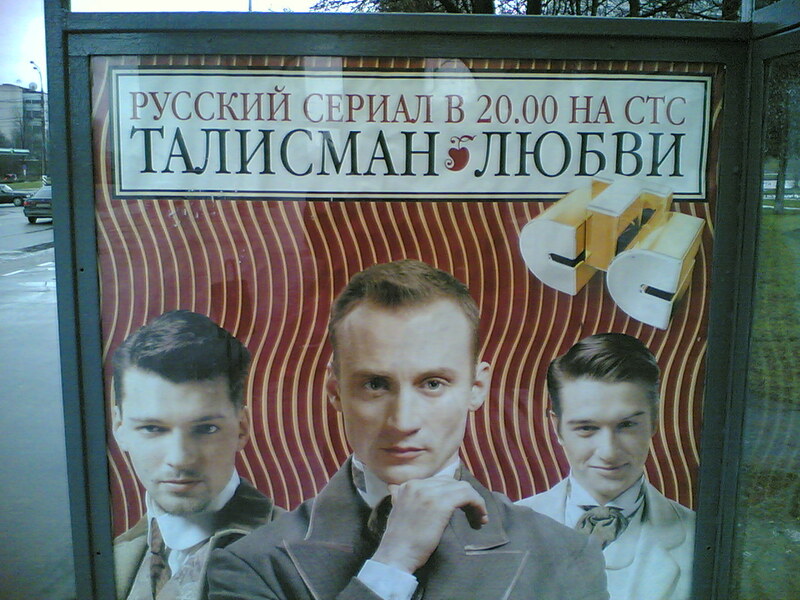 The youth aged below 18 liked the smartphone very much, in some it was even delighted. Young people aged 18-20 and interested in new products found the design cheap, especially when the smartphone was open, besides the opening process with the big button involved was associated with cheap Chinese toys from the childhood. Older people and those who are little interested in new products found the smartphone unusual because of its look, the overall perception of design was neutral. The color solution is rich (from white to red), we had at our disposal a dark blue version. The assembly quality proved relatively high - there was no backlash, joints are almost not noticeable. The quality of plastic is high, the casing is nice to touch. There are grooves at sides, so the device doesn't slip in hands. Let's give it give it due, the smartphone is really one of the smallest on the market, have a look at photos below and compare (dimensions - 103.5x57.7x24 mm and weight - 130 g). However, because of its thickness when closed and its length with the cover up the device doesn't feel super small (for a smartphone, of cause) in real life, we'd rather speak about restrained dimensions. After you shut the cover (it "lands" on rubber pillows), through the oval window you can see time, which is displayed for several seconds, then the screen fades and the front side of the cover turns nearly into a mirror. When the smartphone is closed you can adjust sound volume of the ring tone with buttons located at the left side. The screen displays the caller number, the name and the photo. In case of an incoming SMS, you can hardly see a part of the text in the window. In all, the way the info is displayed in the window doesn't seem to be well thought-out, the smartphone features poor functionality with the flip cover shut. In addition to already mentioned duplex sound volume button you can find a camera button at the left side. On the top are a power button (hold it to switch off radio part of the smartphone) and two LED indicators. One can hardly make out by the LED whether the device is fully charged, it always glows red. To the right are an infrared port, a soft reset button and expansion slot for SD/MMC cards. You can also find a hole to fasten the lace and carry the smartphone on the neck or the hand. At the bottom we come across a synchronization connector, a silo and a headset jack. The stylus is small and folding, Sony models used to have such pens. There is a peculiar thing about the 2.5 mm headset jack. We tried to plug a 3.5 mm adapter or a headset from another smartphone, in result the red button (End) got stuck (contacts seem to get sealed in), every other try provoked a hard reset (it was not a proto, but a factory specimen). The 5D pad is of average comfort, it doesn't always render down push correctly (when you bend the joystick down, you can hear a distinct response, but actual action doesn't follow, you should apply more strength), however, there is no problem getting used to it. The back panel hides the battery compartment, an extra speaker and a camera lens. Well, it's time to pass over to the camera. As I've mentioned, the company stakes on the camera and focuses the fact that it is the first Palm OS smartphone with the camera of such resolution. The camera is located at the back panel, but it would have been more logically to set it on the cover. It turns out that snapping portrait photos isn't comfortable. 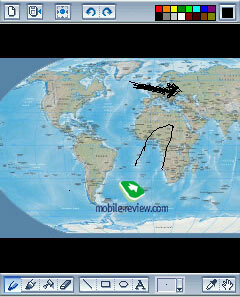 But if you want to make landscape photos, you'll face more difficulties. Youк right hand doesn't feel comfortable because of the open flip cover (I'd remind you that the camera function is active, only when the cover is open). You place your forefinger or middle finger on the shutter button, and the rest fingers unwillingly shut a part of the lens, which is very close. I doubt that you'll get used to this original thing quickly. There is a 2x digital zoom, 4 shooting modes (auto, daylight, artificial light, night mode). That's all for the settings. It takes some 5 seconds to save the picture after the shutter button went off. 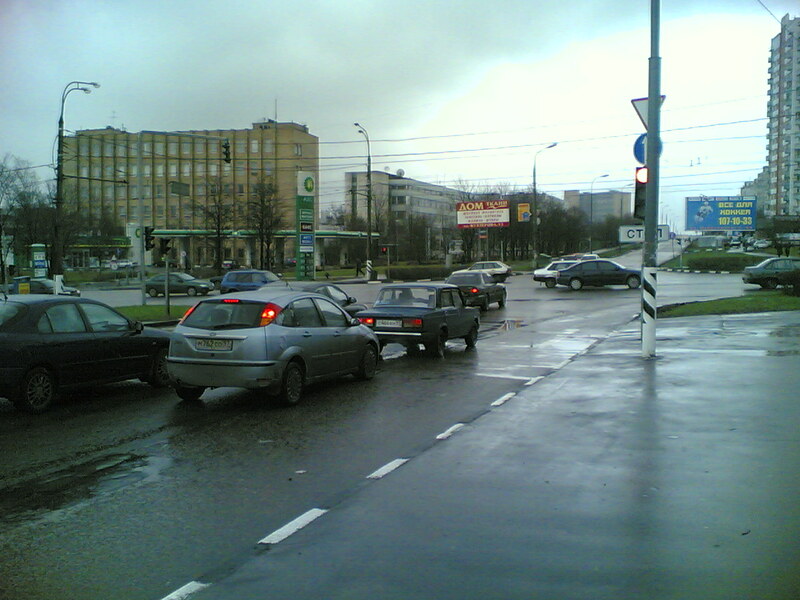 The pictures are of average quality, you can make sure of it by comparing them with that taken by Nokia 6680. It's possible to set either 10 or 15 frames per second. Video can be recorded with the sound. The quality of the clips proves to be average. Well, the camera features poor ergonomics, and quality of photos leaves much to be desired. The only positive moment is that the smartphone does have the camera of such resolution. The Li-Ion battery of the smartphone is capacious of just 1000 mAh, remember that Palm Treo 650 has a battery of almost double capacity. The real tests revealed that the battery life was at a low level. 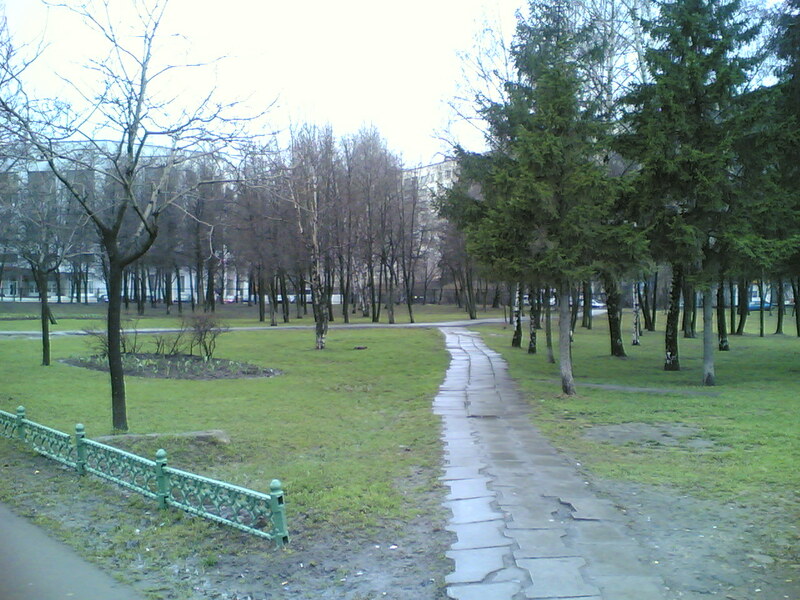 Under the conditions of the Moscow network MTS the smartphone was good for a day and a half with 10-15 minutes talks per day and an hour of other functions. If you are an active user, you'll have to charge the device at least once a day. 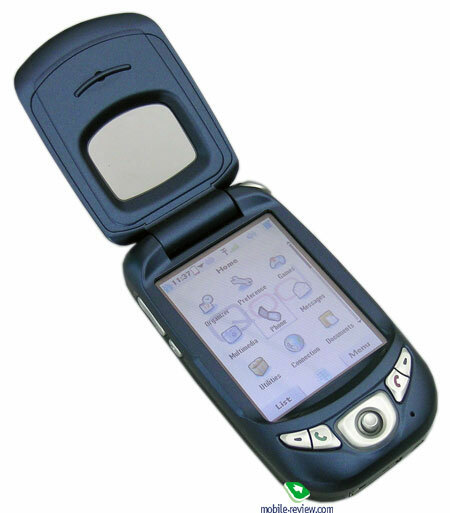 The smartphone lags far behind Palm Treo and HP iPaq h6340. Under the maximum load we launched the clip from the memory card with Kinoma Player 3 EX application, the backlight level was the highest. 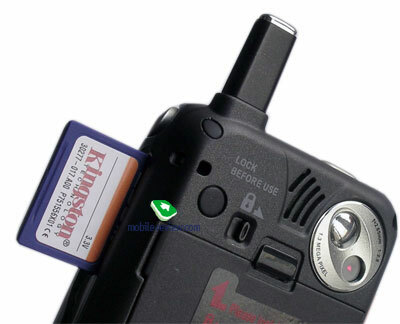 In the MP3 mode we played music from the memory card at an ear-pleasant sound volume, the screen was off. In the reading mode the backlight was set at the lowest level, and auto scrolling ran with iSilo program. For the first time we hold a Palm OS device with a 320x240 pixel resolution, this resolution got the support in the new OS version (Palm OS 5Garnet). This is non-typical for Palm, but for Pocket PC smartphones of the recent generation (other features also agree - a 2.8" diagonal, 65K colors). The screen is transflective and proves good indoors and under the sunlight. 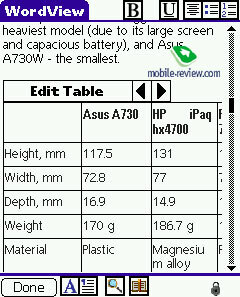 The picture quality can be compared with Pocket PC analogs. 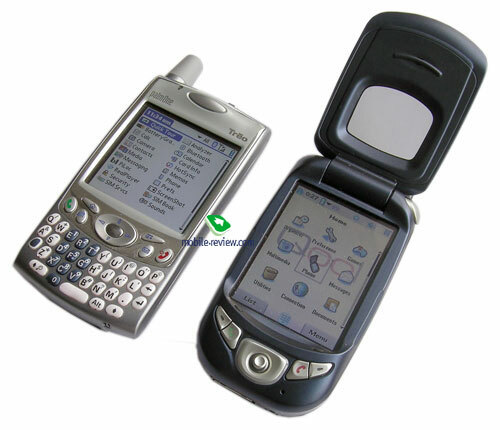 The backlight is changed smoothly, its lowest level is comfortable to handle the smartphone in the dark, however it is much higher compared to Palm Treo 650. The smartphone lacks interfaces - there is only an infrared port. The major flaw of the device is the lack of Bluetooth. 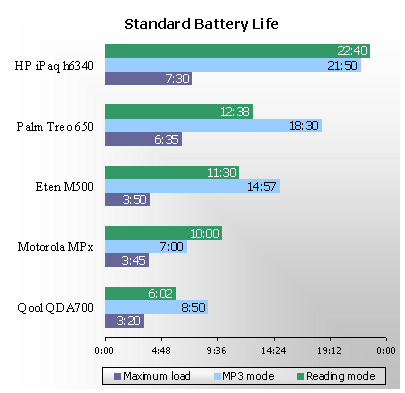 The QDA700 is equipped with a relatively old processor, Motorola I.MXL, which works at the maximum clock rate of 200 MHz (it comes with budget PDAs by Sony). There are 17 MB of flash memory available and 10 MB RAM available. The processor copes with all main functions. 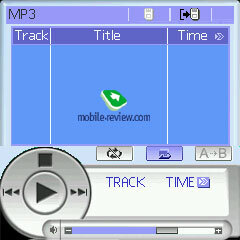 You'll face some problems, when you try listening to MP3 and watching video at the same time. So you'll notice slow work. Let's see the results of formal synthetic tests. 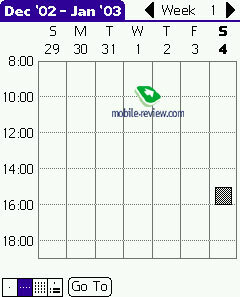 The smartphone is powered by Palm OS Garnet 5.4.0 (follow the link to PalmSource web site and read about innovations). We'd tell you about built-in applications, which are changed and standard icons redesigned compared with the standard (supplied in the base OS version). In all, the old programs react correctly to the new screen resolution. Some applications, for example, iSilo are adjusted to the new resolution, and the programs adapted for 320x240 face the following situation. Roughly speaking, the operating system sets a 160x160 pixel resolution and then stretches the picture. First of all we are interested in phone functions, here we come across many non-standard things. I'd start with an alternative tasks manager (Launcher II v. 1.2.3). The application is oriented foe single-handed work without the touch screen, however in many cases you'll need the stylus. There are the following icons on the top line - return to the start up screen (home), time and battery charge level (tap the battery icon to adjust backlight level), and if you tap network reception icon, you could get connected via GPRS, for example. 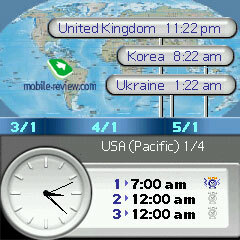 Here you can also tune sound volume. 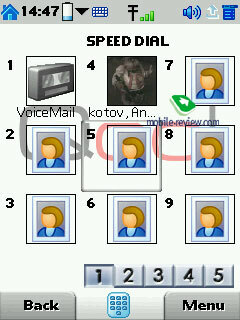 This is number dialing screen. 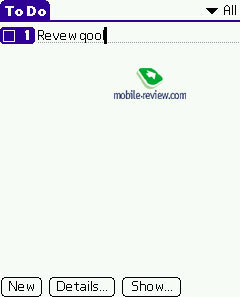 When you tap the cloud with the exclamation mark, you go to Today View and see missed alarms, calls and unread SMS/MMS. 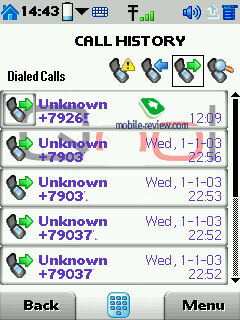 The call log looks this way, the info on the call duration isn't saved, so have to guess it. 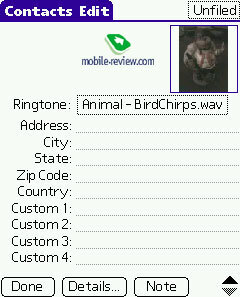 The calls can't be grouped by phone number. The implementation of quick calls is good, you can set up to 45 contacts. 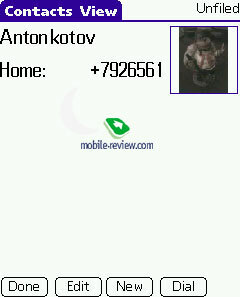 The photo of the contact is displayed as the icon. 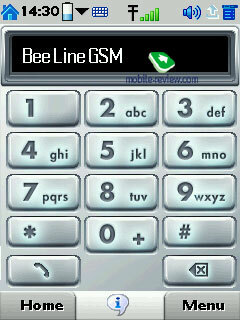 We failed to launch SIM-menu from the Beeline card, an error happened. The opportunities of the phone book are less than in Palm Treo 650 - there are fewer fields. 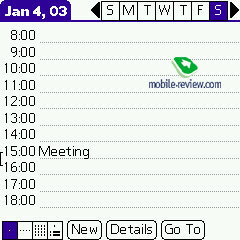 The organizer includes: Calculator, Calendar, Memo Pad and Tasks. 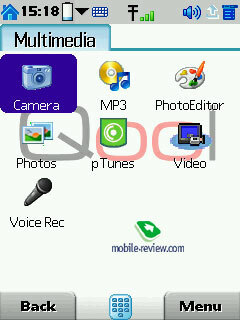 Photo editor and photo viewer. 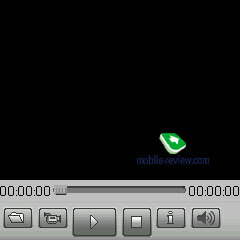 Video recording and video viewer. The voice recorder saves the info on the memory card; the duration of the recording depends on the free space available on the card. Utilities section gathered the following applications: Backup (it's possible to run backup on schedule), Clock (here you can set the alarm clock, display time in various time zones). 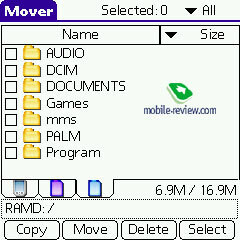 Mover is meant for transferring and copying of files, it's a simple file browser. 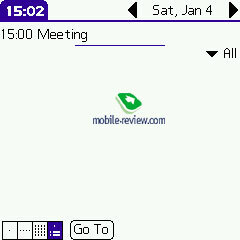 Documents To Go ver. 6 and PalmReader are also preinstalled. 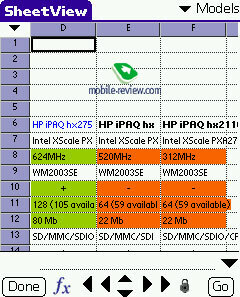 The network reception quality is average. The speaker produces low sound, so you don't hear your call mate well, the sound is blurred. The back speaker is loud enough in most cases during incoming calls, you can set an MP3-files as the ring tone. The vibrating alert has average strength. There are plenty of defects in the model: a weak radio block, a short battery life, a satisfactory camera quality, poor camera ergonomics. The lack of Bluetooth adds a great minus, besides non-standard screen resolution doesn't allow some applications to work. 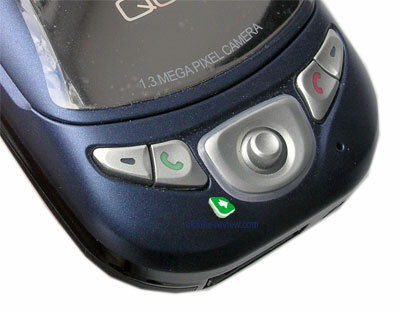 Ergonomics of menu and application buttons is average, it wasn't thought out as in case with Palm Treo 650. As for the advantages, we can name small dimensions and light weight, rich set of extra applications, original design and the existence of a 1.3-megapixel camera. The retail price of $550-600 doesn't seem adequate for such device. The price shouldn't exceed $300-350, only in this case it becomes somewhat interesting. 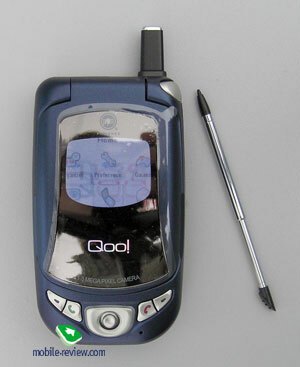 We'd recommend you Qool QDA700, if you need a rare model, which nobody else has, otherwise you'd better have a look at other models, for example, Palm Treo 650 or HTC Magician (Qtek S100, I-Mate Jam).